Stephens wins in straight sets, 6-3, 6-0, to capture her first Grand Slam title. 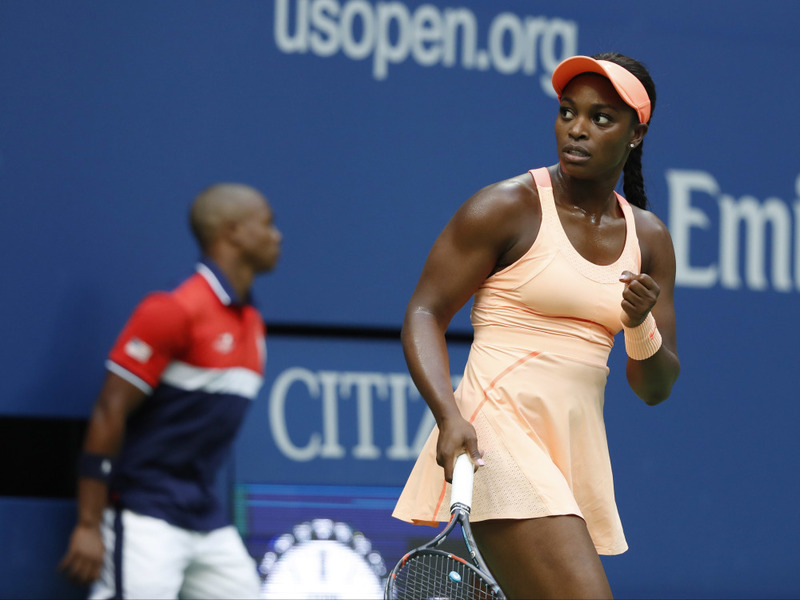 NEW YORK — Sloane Stephens never looked shaken by the setting or the stakes in her first Grand Slam final. Her opponent, Madison Keys, most definitely did. Stephens easily beat her close friend Keys 6-3, 6-0 to win the U.S. Open on Saturday, capping a remarkably rapid rise after sitting out 11 months because of foot surgery. The 83rd-ranked Stephens, who beat Venus Williams in the semifinals, is only the second unseeded woman to win the tournament in the Open era, which began in 1968. A year ago, she sat out the U.S. Open altogether because of what turned out to be a stress fracture in her left foot. She had an operation in January, and made her season debut at Wimbledon in July, exiting in the first round. She lost her next match, too, in Washington. Since then, she has gone 15-2, and her ranking has soared from outside the top 900 to what will be around No. 20 as of Monday. Oh, and, don’t forget: She is now, and forever will be, a Grand Slam champion. This was only the second time in the Open era that two women were making their Grand Slam final debuts against each other in New York. Stephens most certainly handled the occasion better, claiming the last eight games and making only six unforced errors – Keys had 30 – in the entire 61-minute mismatch. Keys, 22, and Stephens, 24, have known each other for years. They texted and spoke on the phone early in 2017 , when both sat out the Australian Open because of operations – Keys on her left wrist, Stephens on her left foot. When the match ended, they met at the net for a long hug. While waiting for the trophy ceremony to begin, Stephens walked over and plopped herself down in a courtside chair next to Keys, so they could chat side-by-side. “Sloane is truly one of my favorite people and to get to play her was really special. Obviously I didn’t play my best tennis today and was disappointed,” Keys said. They hammed it up afterward, too. When Stephens was presented with her $3.7 million winner’s check, she grabbed Keys’ arm, as if to stop herself from fainting at the sum. There hadn’t been an all-American women’s final at Flushing Meadows since 2002, when Serena Williams beat her older sister Venus.